May 6, 2016 (Ottawa) As National Nursing Week celebrations kick off across the country next week, the Canadian Federation of Nurses Unions (CFNU) will celebrate the tremendously positive impact nurses can exert on the health of Canadians and the delivery of health care across the country. Canada’s nurses have requested meetings with provincial health ministers during National Nursing Week to share smart health policy solutions driven by the best evidence. Nurses comprise the largest group within every provincial health care workforce and are a critical element of Canada’s health systems. Nurses work at every point across the continuum of care in public health, acute care, long-term, home care and palliative care. A growing body of scientific evidence on safe staffing patterns confirms that a more effective distribution and utilization of the nursing workforce has the potential to yield a significant return on investment for health care budgets and, most importantly, positive impacts for overall patient safety. 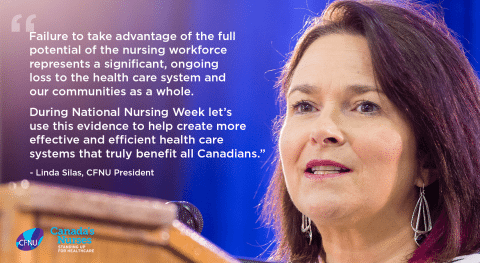 “Failure to take advantage of the full potential of the nursing workforce represents a significant, ongoing loss to the health care system and our communities as a whole,” said CFNU president Linda Silas. “During National Nursing Week let’s use this evidence to help create more effective and efficient health care systems that truly benefit all Canadians,” said Silas. Despite two decades of evidence showing that patient safety and quality of care are directly linked to safe staffing levels and an appropriate mix of nurses, Canada’s nurses worry that the potential return on investment of an optimally deployed nursing workforce is often not considered when budgets are made. Ultimately, a smarter distribution and utilization of the nursing workforce would result in overall reduced costs to our health care system through better management of chronic diseases, improved continuity of care and patient follow-up, greater access to services, fewer deaths, fewer adverse events and complications, shorter hospital stays, and fewer avoidable admissions. Given the potential savings offsets, safe staffing levels can be achieved with little or no net cost to systems.